4000 Rivets : Our solar set up! Several people have asked about our solar set up and the equipment we have so I thought a blog post about our system would be helpful. 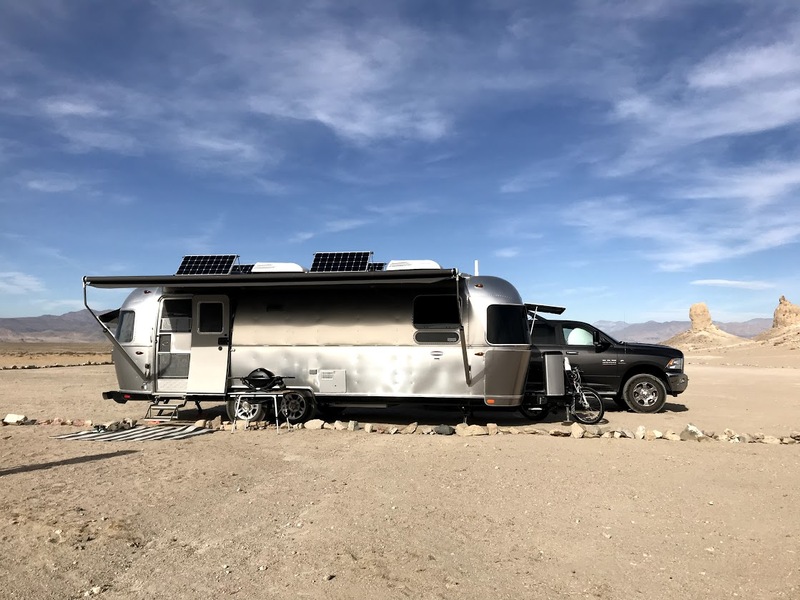 We knew starting out that we would be doing some boondocking and plenty of dry camping so solar was always going to be part of the modifications we would add to the Airstream. We considered, briefly, using a generator for battery charging and those times when there may be some high electrical needs but liked the idea of solar for its simplicity, clean energy and quiet operation. Not having a generator also means no extra fuel to carry around and less equipment to haul in the bed of the pickup. You can get propane powered generators that can run off of the same propane tanks on the Airstream but the idea of the extra equipment and the noise that they generate didn’t really appeal to us. 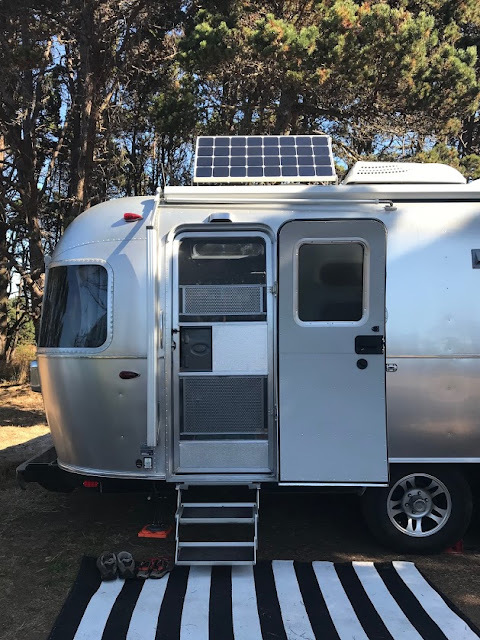 We had a simple solar set up on our Sportsmobile, prior to buying the Airstream, so we had a little knowledge about panels and batteries but knew we needed someone with a lot more expertise than we had. Our research on Airstream Forums led us to make a call to Lew Farber. From the Forum we could tell that Lew had the knowledge and experience and that he would do a first class job. 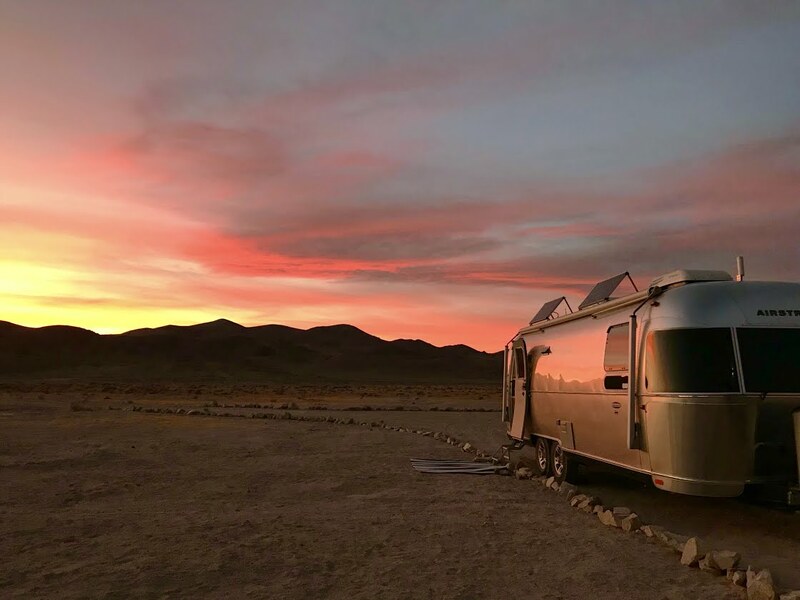 We contacted Lew in November 2016 to start the discussions knowing he would be in Hood River, OR for the summer and we planned to be making our first extended trip with the Airstream at the end of May as we would be heading for the Oregon Coast. We thought that if he had a time slot open, we could drop the Airstream off with Lew while we were at the coast for two weeks and then pick it up after our stay. As it turned out, that’s exactly how it worked out. We had several conversations with Lew over the first few months about panels, batteries and whether we needed to upgrade the inverter. 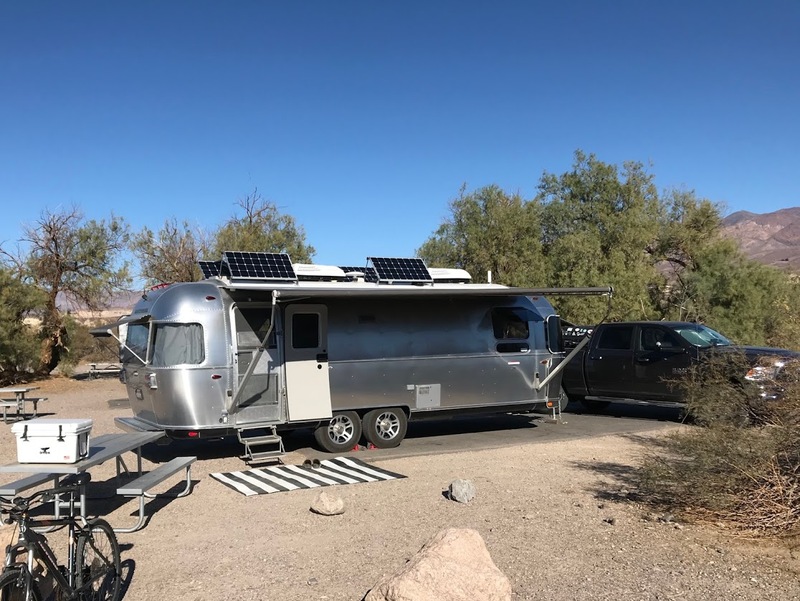 Our Airstream, a 2017 27FB International Signature, came with the standard Interstate batteries located in the box on the tongue, a 1000 watt inverter, and a simple converter for charging the batteries. We also discussed the advantages and disadvantages of AGM batteries vs Lithium and the size and number of solar panels that we needed, and could expand to, given the roof area we had. Lew put together several options and what each would cost. It didn’t take long to know that we had made the right choice to have an expert like Lew design our system and educate us on our options. 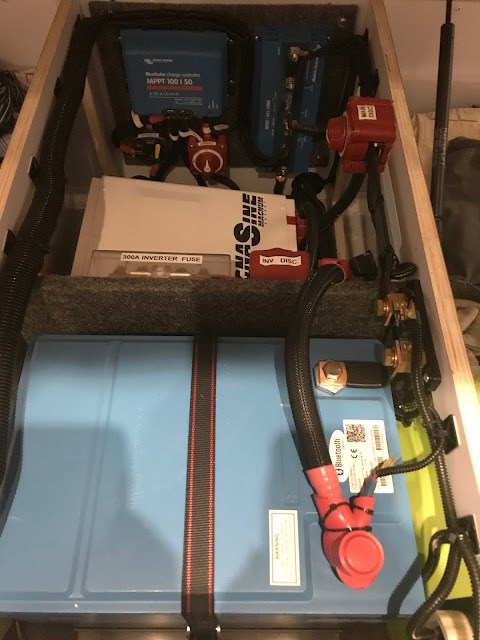 Having the 300 ah Lithium batteries and the soft start allows us to run the air conditioner for 1 to 2 hours on the battery bank without being plugged in to shore power or a generator. We also have a blue tooth monitoring system that runs through an app on our iPhones which allows us to monitor our panels and batteries. The battery, battery monitor, charge controller and inverter/charger are all located under the bed. The panels, of course, are on the roof. All the wiring is run down through the refrigerator vent so no penetrations were made in the roof, including the weBoost wiring. 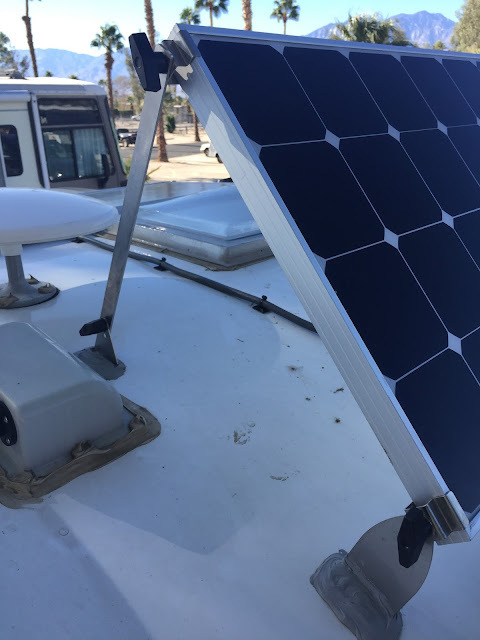 The panels and weboost antenna are mounted with double stick tape and Dicor sealant, also assuring that no mounting holes were made in the roof. I won’t go into details about the equipment and the specifications. If you are interested, AM Solar (amsolar.com) has a great web site and discusses equipment options, specifications and advantages and disadvantages of each component. Lew at Solar Tech Energy Systems has been in the RV and Marine solar installation business for many years and is recognized as one of the top providers/installers in the United States. He spends his winters in Naples, FL and summers in Hood River, OR. You can contact Lew, if you are interested in working with him on a solar setup, for your RV or boat at 4rvsolar@gmail.com. 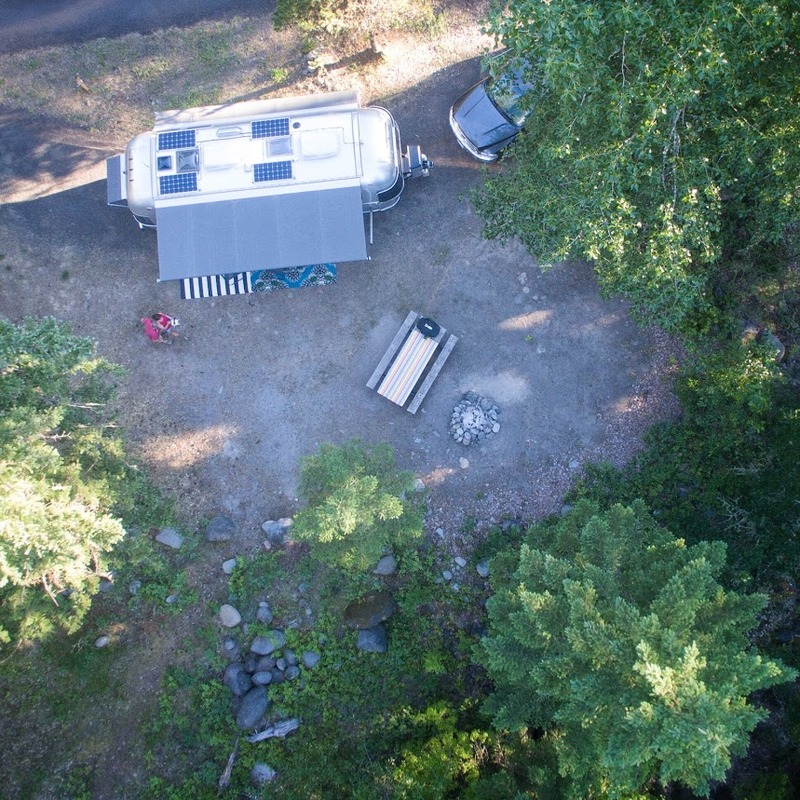 We have been on the road for 7 months and have relied on our solar many times. It has never failed us and we know that if issues arise, Lew is just a phone call away! 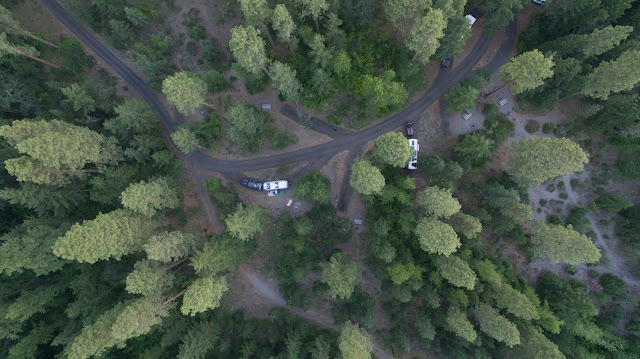 A drone shot of our new panels, right after the install. MacKerricher State Park, panels tilted to better capture to the sun. I know this is too far away to see the solar panels, but what a cool shot, huh?!!! Parkdale, OR...we didn't see a lot of sun in these trees, but we sure enjoyed this spot. Battery, inverter/charger, charge controller and battery monitoring system under the bed. If we can help answer any further questions, please don't hesitate to send us an email or give us a call!